Wall Mount Bracket for Suspension Straps professionally for you to create a safe and enjoyable fitness experience. A stylish and new way for exercise and training. Suspension training is quickly becoming one of America's favorite ways to burn fat, build muscle, and increase flexibility. Tested to withstand 750 pounds. Superior quality metal not only affordable, durable, but also convenient and safe. 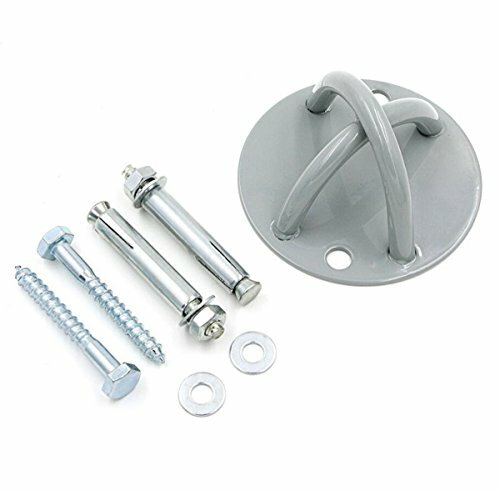 Easily attach to a wall, vertical stud or secure overhead beam. Suitable for you to install in any place. Help to run home into a gym,creating an indoor hanging garden. Much more safety and solid,it can be used for a very long time. Useful in gym and home,enjoy your fitness exercise everywhere. Easily to attached to the wall,including fitting instructions & 2 different sets of screws. Built with superior quality metal,very durable and strong,it can withstand enormous pressure. If you have any questions about this product by ZYZH, contact us by completing and submitting the form below. If you are looking for a specif part number, please include it with your message.